Marble, 180 x 60 x 50 cm. This sculpture by H.W. Bissen captures an intimate moment where the Roman goddess of love, Venus, is in the process of titivating herself. Wearing only a single piece of garment which has slipped past her waist, the graceful goddess is tying up her hair. Typical of the Classical style, Bissen has depicted the motion of the body with harmony, clarity and balance in mind. The sculpture stands in the Classical contrapposto position, where all her weight is on one leg while the other is bent slightly forward. This pose results in a natural inclination of the hip while simultaneously giving the composition a rhythmic and balanced appearance. 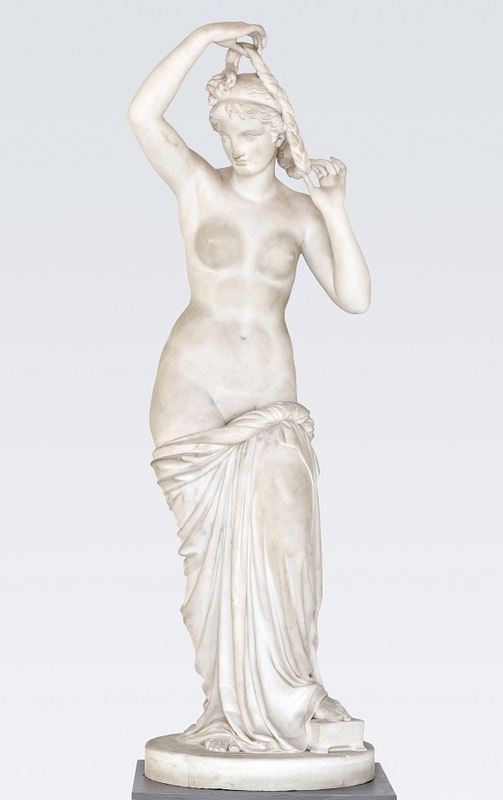 The artist was likely inspired by the antique Venus Anadyomene statue, which is still on display in the Vatican today. During his stay in Rome, Bissen sketched a number of detailed drawings of this statue, which has a similar pose to the one by the Danish sculptor.